I couldn’t blame her. Although I had started off by mentioning all the things we look for, it’s true that most of my remarks consisted of advice on how to avoid having your résumé chucked in the reject pile. The list of positives, on the other hand, was very short—perhaps I should have repeated it at the end. So for her benefit and yours, I’ll list again the most important things an applicant can offer if she wants to impress us. I would guess that they are the same elsewhere. —Experience. From freelancers, we want to see a list of scholarly books the candidate has edited and the contact information of assigning editors. —Skills. The cover letter and résumé should be error-free, and they should be written in Chicago style. —Honesty. If you don’t know Chicago style, your application materials will betray you, guaranteed. Forget the clever wordplay. Write in a straightforward way, as you would to an author you are editing. And if you’re curious about that long list of application turnoffs, you can read about it here. I just bought your book, and I'm really looking forward to reading it. As to this post, I was wondering if you could be more specific about who exactly is hiring a freelance copyeditor in this instance? Do you mean a book publisher looking to hire copyeditors for specific projects? 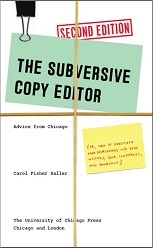 What made me wonder was the fact that you noted that freelance copyeditors should use CMS style in their resume/cover letter, when many freelancers work from other stylebooks (AP, APA, MLA), or switch back and forth depending on the work they are editing. Can you post a little bit more information about the person or company looking for these specific traits in a copyeditor? Thank you so much for your valuable insights, by the way. I'm glad I discovered your work! Molly, thanks for asking. My list was definitely in response to the question of what my company (the University of Chicago Press) looks for in freelancers, which is why I specified Chicago style. If a freelancer is fluent in MLA, APA, or any other style, we consider that a plus, but we like to see Chicago style demonstrated in the application materials. I read this post and the 2010 post on application turnoffs. Alongside your other writings, the posts made me wonder whether you do anything in particular to weed out zombie-rule-enforcing editors. I'd love to hear about your approach to freelancers with that tendency and to their editing. This is a great list of necessities for a resume. Though it may be short, these items are crucial--and by no means easy to accomplish to perfection on a resume. Thank you, Carol, for sharing these items. I will definitely have to review my resume to be sure I follow the dos and not the don'ts! Even though these items are specific to the University of Chicago Press, I think they are highly applicable for any employer, though the resume may need to be tailored to that specific employer. EditorAM, some of our freelancers are former colleagues, now retired, so they have more experience than I do and end up teaching me things I didn't know. But when I work with a new editor, I look closely at the first edited chapter. If I were to see a pattern of rigidity, I would give detailed feedback and ask to see the next chapter as well. If the problem continued, I might have to take back the manuscript. Fortunately, this has never happened to me! Yeah, I know this is quite a while after you wrote this post, but as I just found your blog recently, I thought I'd add a comment anyway (it's a great read, btw). You mention experience as being the most important thing, so what do those of us just starting out do? How do we get the experience to put on those resumes? Stom, it's a great question, and the answer is longer than I can post here. If you don't mind my using your question as a jumping-off point, maybe I'll blog about this topic soon. Meanwhile, I suggest that you take a copyediting class or otherwise learn one of the most popular style manuals. If you can ace a copyediting test, you'll be well positioned for an entry-level job, since most candidates are not able to do that, even those with experience. Thanks forthe response :) I look forward to reading it.